New Assetto Corsa series starting 22/10/2018! Sim Racing System Sim Racing System News New Assetto Corsa series starting 22/10/2018! New Assetto Corsa series starting October 22nd! 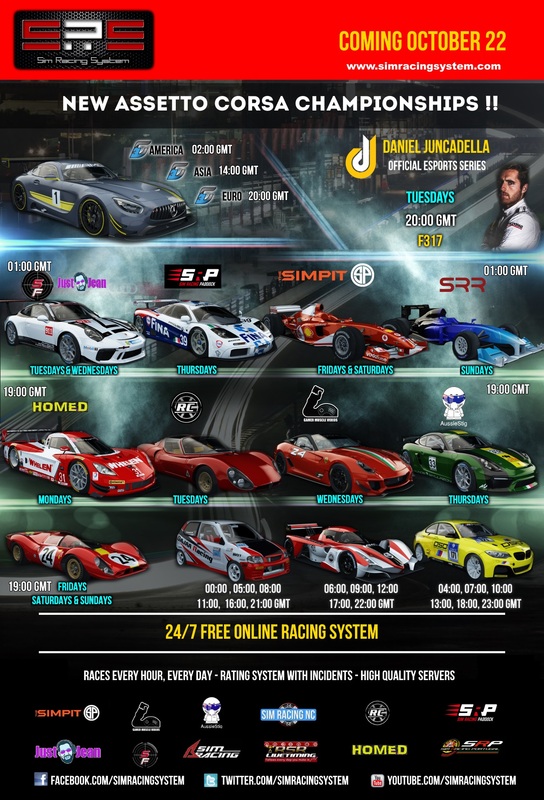 We are delighted to announce the second Official Daniel Juncadella eSports Series at SRS!! The series will run on tuesdays, 20:00 GMT with the Dallara Formula 3 F317 from RSR(fixed setup). 10 min Qualify + 20 min Race for all races! Car: All available GT3 from Kunos. Nah Martijn, F3 is boring. Come and drive some Suzuki Alto with me I'm coming back! Yes!!!! Great season is going to be!! Love to drive GT3 cars, especially the 488 !!! thank you! ooooo might have to join in on the simpit races next season! Should be some fun races. Open wheel car this series! oops, yes sorry I completely didn't see that! Thanks! Which version will Suzuki Alto 660 go out of many? Is it permissible for a wide range of bumpers?